This morning, we have a special guest here at LENNDEVOURS. You may know his simply as Adam Roberts or The Amateur Gourmet. But to me, he's one of the best--and most entertaining--food bloggers around. 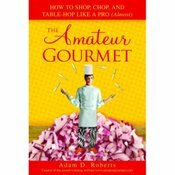 And, he's written a book titled The Amateur Gourmet: How to Shop, Chop, and Table Hop Like a Pro (Almost). We're proud to welcome Adam as he continues his virtual book tour, and while wine isn't a big part of his new book, we thought we'd talk a bit about it anyway. LENN: Good morning, Adam, and thanks for taking the time to sit down with us. Your book is at least partially about your transition from microwave cooking guru to true gourmand. Have you had a similar transition in your beverages? ADAM: Yes, I think I have had a similar transition with beverages. I mean, look, I won't lie: I'm still pretty naive when it comes to wine. I can tell a white from a red, usually by the color, and that's about it. LENN Do you remember the first bottle of wine that you tasted? ADAM: The first bottle of wine that I had... hmmm... the Manischevitz we drank at Passover growing up? And I really liked that: I like sweet drinks, even though most people think it tastes like cough syrup. LENN: In your book, we learn that you and your parents ate out almost every night. 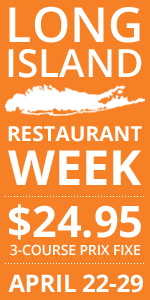 Did your parents drink wine when you were growing up--at all those restaurants? ADAM: Yes--though my dad would usually have a cocktail (a Tanquerey and tonic) while my mom would order wine by the glass. She'd almost always order Chardonnay, when it was trendy she drank Merlot, and now I bully her into drinking Riesling and Pinot Noir. She really likes California Chardonnay, though, that's her favorite. LENN: And do you remember the first bottle where you said "Hey, this stuff is good."? 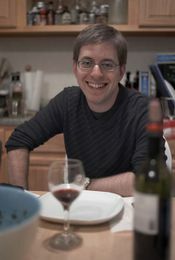 ADAM: It's hard to pinpoint a specific bottle from a specific time, but I've definitely had illuminating wine moments. Just recently I made a rib-eye steak and the man at my local wine shop suggested a Spanish Priorat to go with it. I'd never had a Priorat, and somehow the spiciness of the wine--the boldness--took the whole steak-eating experience to a new level. It's difficult to explain to someone who doesn't drink, but the complexity of the wine creates a supernatural mist in your mouth that makes the steak taste like a gift from the gods. LENN: When the Amateur Gourmet isn't enjoying wine, what does he drink? ADAM: The Amateur Gourmet isn't much of a drinker, but when I do drink (and I assume you mean drinking alcohol) I enjoy my dad's drink, a Tanquerey and Tonic, because it's crisp and refreshing. I also like to drink specialty cocktails when visiting a restaurant with an adventurous drink menu. For example, at Babbo I always get the Bellini because it changes seasonally. I was just there recently and they had a passionfruit bellini that was tingly and delightful. LENN: In your book, you lean on Derrick Schneider as your wine expert. When did you first meet Derrick and why did you ping him for your pairings? You know that he lives all the way in the Bay area and you have a wine blogger much closer *ahem*. Heck, Clotilde, had that New York blogger do pairings for her book, and she's in France! ADAM: You have no idea how much campaigning Derrick did to be my wine expert. Singing telegrams at 5 in the morning, airplanes flying over head with banners that read "Make Me Your Wine Expert." You, on the other hand, didn't even bother to send me a case of expensive Champagne. How could I pick you? But, in all seriousness, I first met Derrick a year or two ago when he and his wife Melissa (a long-time reader of my site) visited New York and invited me to dinner at Craft. We had a great time and I learned a great deal about wine that night (one of the stories from that dinner is in the book). So when it came time to make pairings for my final feast, I turned to Derrick and he was great. Now when I think about leg of lamb I hear Derrick's voice in my head cheering: "Rhone! Rhone! Rhone!" Do you agree with that pairing, Lenn? LENN: Yes, I do actually. But enough about me--err that New York wine blogger--let's get back to your book. As an avid reader of Amateur Gourmet, I was a little worried that the book would be filled with stuff that I already knew about you. Stories you've already told. Leftovers reheated. What I loved about it was how familiar it all seemed and how comfortable, but I learned a lot more about you. Was it a challenge to be even more personal with the book, given the personal nature of your blog to begin with? ADAM: Well thank you, I'm glad you had that reaction. The thing about the blog is, I can talk about Craig (my boyfriend), Diana (my roommate), my parents, my brother, over and over again and then one day a new reader pops up and I make a reference to Craig or Diana or my Aunt Phyllis and the reader says, "Who's Craig? Who's Diana?" and that grows frustrating after a while. WIth the book, there's a greater sense of permanence. I introduce a "character" and presumably the reader, who is reading the book from beginning to end, will remember who this person is, their relationship with me, and will appreciate it when the character pops up again later. So it's easier to be personal with the book because I don't have to keep explaining who everyone is. LENN: Overall, was it easier or harder to write this book than you expected? ADAM: Hmmm...both? I mean, it was easier than I expected in that I had a lot of energy to do it, I was very eager to write my first book, and many of the chapters wrote themselves. It was harder in that with a book, unlike writing a blog post, writing those chapters is just the beginning. Then you re-read what you've written, you revise, you tinker, you move things around, you start again. Then, when that's done, you read it again and you tinker again, you throw things out, you hate the first chapter, you love the last chapter and so on. And THEN you send it to your editor who reads it and says, "It's great! But Chapter 7 isn't working; I don't get why you made that choice in Chapter 5; and the Introduction needs work." And you do it again. Then you send it back. And it happens again. And again. And again. It's unbelievable how much work goes into writing a book. Then there's a proofreader... and then there's the first pass... the second pass. I've read my book 800000 times. LENN: Are you planning to write another book? Somehow I can see you doing a series of city-focused, food travel books. You know, like Bordain but without the vulgarity and offal. ADAM: Ha. Well, I'd like to write another book but I'm not quite sure that'll be the angle. I have a few ideas up my sleeve, including: "Lenn Thompson: The Unauthorized Biography." LENN: Okay, back to wine again, this is a wine blog after all. Do you have a 'house' wine that you drink regularly? ADAM: Pinot Grigio, because it's crisp, it's light, and it's cheap. These days I'm loving Pinot Noir. I made chili the other night for a group of friends and both sets of friends brought Pinot Noir and it was terrific. I'm starting to really like red. LENN: Is there a 'classic' wine or wine and food pairing that you just can't make yourself enjoy? ADAM: Nope! I like it all. Although (and lean in closely, so I don't offend anyone): I think I like French wines better than Italian wines. Shhh... it's our little secret. LENN: I prefer French wine too, so we'll both keep that secret. Wine enjoyment is about more than just the wine itself. Describe the combination of wine, locations, food, company, etc. that would make (or has made) for the ultimate wine-drinking experience. I assume Craig would be involved. ADAM: Ok it's the most notorious thing I've done on my blog next to breast cupcakes and offending New York food icons, but that dinner Craig and I had at Alain Ducasse was just one of the most deliriously happy nights of my life. We were in this VIP room, everyone was doting on us, the food was very good but the wine was EXCELLENT and the sommelier explained everything so thoroughly and with such passion that it lifted the experience beyond anything I'd experienced before. I'm not sure what it was about that wine---maybe because it was such an eclectic list?--but I'd never tasted anything like it. The sommelier would describe vineyards in French countrysides and then I'd take a sip and suddenly I was a little boy in a beret running through a field humming the theme from "The Umbrellas of Cherbourg." We didn't take the subway home that night, we floated home on a cloud of gastronomic ecstasy. And, naturally, the feast I cooked for the last chapter of my book. That was a really special night---I'll let your readers discover that when they read the book themselves. 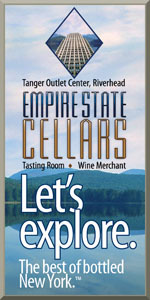 LENN: And last, but not least, when are you and a few of your friends going to come to Long Island wine country so I can show you around? ADAM: How's next month? Seriously! And I may bring a video camera, I want to start doing more videos on my site. I'll make you a star! Get Adam's book today. I highly recommend it. That was cool. I got a chance to chat with Adam the other day at Gastronomie! Great interview! I wish Adam came out here to the West Coast more often.